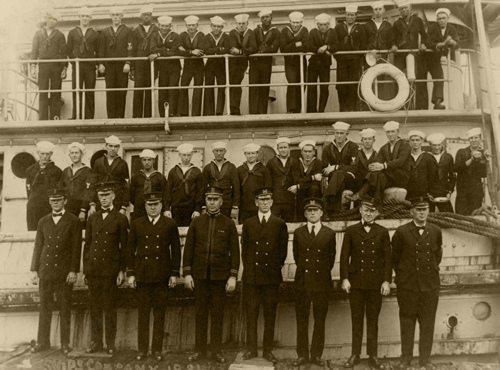 When a U.S. naval tugboat with 56 men aboard vanished without a trace 95 years ago, the Navy mounted one of the largest sea and air searches of the early 20th century. Although a flotilla including submarines and destroyers scanned more than a million square kilometers of ocean, the mystery went unsolved. Now a combination of high-tech underwater equipment, detective work, and skillful pattern recognition has led to the long-missing wreck of the USS Conestoga and the likely story of what happened to the ill-fated ship. The corroded remains of the Conestoga lie at the bottom of the sea, at a depth of 56.5 meters about 5 kilometers from Southeast Farallon Island in the Greater Farallones National Marine Sanctuary, the Navy and the National Oceanic and Atmospheric Administration (NOAA) announced at a ceremony Wednesday at the Navy Memorial in Washington, D. C.
Although the Conestoga was headed from San Francisco, Calif., to American Samoa, nearly 7700 kilometers away, when it vanished, the 51-meter-long steel vessel had made it only about 37 kilometers west from the San Francisco Golden Gate before it sank in heavy seas. 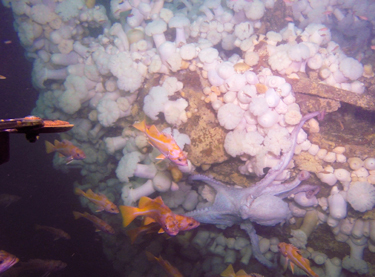 The modern search for the Conestoga began in August 2009 when a routine multibeam sonar survey of the seafloor for NOAA documented a probable and previously uncharted shipwreck. During a September 2014 follow-on mission to identify the wreck, NOAA used an autonomous underwater vehicle (AUV) to conduct a side-scan sonar survey of the site and a remotely operated vehicle (ROV) to acquire video and still imagery. Last October, NOAA used a small Teledyne SeaBotix ROV to explore inside the vessel, according to a NOAA archaeological report. During the expeditions to the wreck, NOAA also conducted some basic marine science, documenting the sea bottom, sediment patterns, and resident marine life, said James Delgado, director of NOAA’s Marine Heritage Program and coprincipal investigator of the 2014 and 2015 missions. 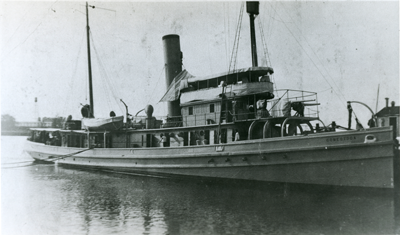 In the days before satellite weather forecasts, the Conestoga steamed out from San Francisco’s Golden Gate at 3:25 p.m. local time into choppy seas, but by 4:00 p.m. the weather log observation of the U.S. Lighthouse Services lightship San Francisco noted gale winds of 40–48 miles per hour (64–77 kilometers per hour), according to the archaeological report. The Conestoga likely “was lost due to steaming into gale-force winds and heavy seas on the afternoon and evening of its departure,” the report states. Delgado said evidence shows that the crew tried to turn back “in a race against the sea and time to get back” to calmer water through the Golden Gate. He said that with time running out, the crew tried instead to reach a nearby lighthouse. “She went down pointing directly at the lighthouse” when the boat sank less than an hour away from it, he said. “It is so overwhelming for all of us but it brings to closure this big mystery we had in our families,” said Diane Gollnitz, 73, of Lutherville, Md., granddaughter of Conestoga officer Lt. Ernest Larkin Jones. “It connects the past, 95 years ago, with all the stories we were told, with the future,” she added, noting that her grandchildren also attended the ceremony. Click below to watch a 2-minute video made by NOAA about the loss and discovery of the Conestoga. Citation: Showstack, R. (2016), Navy ship mysteriously lost in 1921 found via science, sleuthing, Eos, 97, doi:10.1029/2016EO049045. Published on 25 March 2016.